So at level 21 I'm halfway to my 1st prestige. Next set of FL is during the holidays so unlikely to make any progress, May and June might see me get to level 30. Progetto & Skorpion are the two most overrated tanks for the mode. They can deal bunch of (usually pointless damage), but are way too flimsy to fight at the caps and objectives where the points are made, and have basically no precense.You get a credit boost, but that's really it. Usually they just end up scurrying someplace else when any substantial force arrives, or just sit around somewhere waiting for their team to create sniping opportunities. They're like snipers in Battlefield games, sure they can get nice looking damage or kill count while sniffing their own farts, but in the end, they have zero impact the game, and it's really the assaults and medics that take and hold flags. 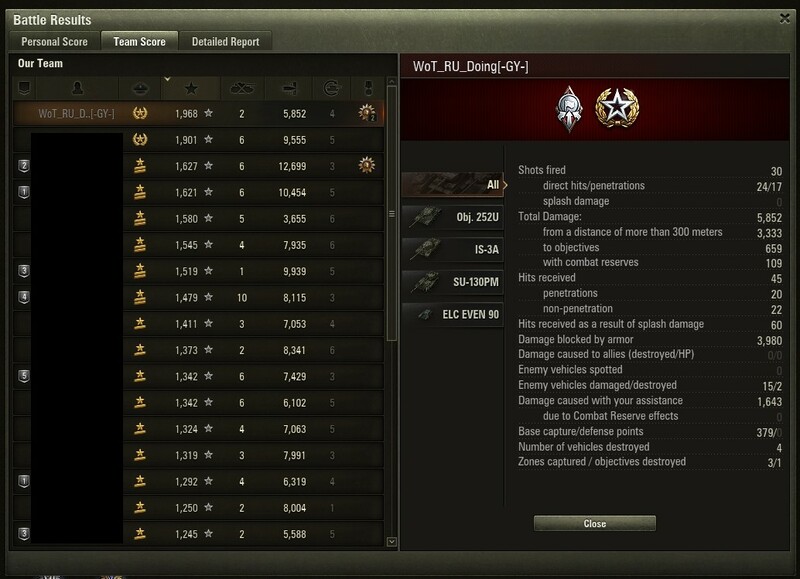 The mode doesn't follow the usual rules of WoT - you can deal 10000 damage in a round that has absolutely no impact, and even worse, damage that can help the enemy team. Semi/mobile heavies and mediums with some staying power are great for the mode and can be found right from the tech-tree - the basically bread and butter tanks : IS-3, T32, Caernarvon, T44. All of them have even multiple premium counterparts, if you want to train crews / get credits. Superheavies (O-Ho, KV-4, VK) are ok for initial flag work, but unplayable unless you're ready to suicide once the fight is over - travel to other areas of the map take just too damn long, and you're really vulnerable during several stages of it. Of TD:s, WZ-120-1 FT and SU-101 are great, since they can actually move up and punch people in the face, instead of relying others to create opportunities. Can you please announce what tier 9 it will be. And now you're telling me that a skyshitter who was sitting all freaking battle at the back deserved to get way more XP than me? WG, what the hell are you smoking? So, maybe it's time to do the same thing? Take [edited]arta, just camp at the back and take easy XP and "General" rank? Why do you even have to bother to go in front and fight with the enemy forces if you can earn easy bonuses just clicking one mouse button all the time? This is disgusting and unfair ffs! Those things must have some kind of a limit, because most of the time, I only see Progetto's or Defenders on top of the teams list. Edited by Hammerhead20, 17 March 2019 - 03:55 PM. If that guy did that, I'm sure I can do the same thing as well. Except that it ignores the fact that you generally need a good team to rank decently in arty...your own shots alone don't do all that much...it's the supporting fire on the stunned enemies that gets you the real progress, especially in the cap circles. However, if you are the only one shooting into the cap, you'll be lucky to make Captain by the end of the game. Edited by WoT_RU_Doing, 17 March 2019 - 09:55 PM. but arty reserve doesn't work that way. It forces people to hide away unspotted for as long as possible while those players who push forward to put pressure on enemy get covered with mass arty spam. Also frontlines for a week are a chore. If they were 7 days spread evenly throughout the month it would be much more bearable, this way it is a hellish week and on the weekend I am already fed up with it. I repeat: those are the numbers before the costs are substracted..... anyone else seen the same thing? Post a couple of replays and show us you getting General, Iron Shield and General of the Army in any arties you want. Should be easy for you right? Strangely when I managed it I found it harder in arty than in normal tanks, I guess I must be doing it all wrong so I am willing to learn the easy method from you. I'd still be interested to hear some results from Hammerhead though, just to see if he changes his mind when he tries arty a few times. Like you say Woolfie, maybe we're doing it wrong, and improving my average ranking next month would be appreciated. He was probably talking about me, I get General nearly every time now in French arty, but only in defence never attack. It's not the damage that gets it, it's the saving capture points. Run arti strike, air stirke and engineering, save them for when the enemy go for big push on cap, then smack them. It's also stun, I get massive amounts of stun because I target helping my players who find themselves one on one and give them enough stun so they can get the kill. I get General before they reach the last objectives. You really have to know where to go though and sometimes I've had to travel from C to A via the back. It's easy running around mindlessly in your wheeled tanks shooting anything you bump into, but avoiding them in arty takes cunning. Yeah it's knowing where to go (which zone and which area withinin that zone), when to go there, how to stay safe while playing arty and moving around/through the zones, which enemy to shoot/stun, choosing exactly when to shoot/stun that enemy. One thing I do different from you CaptBoombeard is that I use Air Recon instead of Inspire. It's possible to get lots of assisted damage/rank points from 2 or 3 cap circles at the same time. But apart from all those points above it requires ''pretty much no effort'' to rank up compared to normal tanks lol. I ran air recon when it first started but found after a while I got more points from engineering when interrupting the cap. Depends on your team I guess, but I always have enough wheeled things on mine to zoom in and spot the cappers.